Hi guys, I wrote an article over at Articlesbase about how to gain weight rapidly. 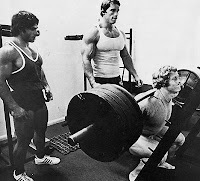 It gives a program about how to incorporate a little-used, yet HIGHLY EFFECTIVE, exercise called Breathing Squats into your bulking up program. The idea is simple -- you want to include the King of all Exercises, the Squat, in your muscle-building workouts. This one offers a twist.